The Onceler travels to a forest, a magical place with Bar-ba-loots and Swomee-swans and Humming-fish and Truffula Trees. The trees are exactly what the Onceler has been searching for to make his new invention – a Thneed. And a Thneed is a thing that everyone needs. So, he takes out his axe and chops down a truffula tree and sits down to knit a Thneed out of the truffula tuft. This is where the Lorax comes in. He speaks for the trees because the trees have no tongues. And he demands to know why the Onceler would chop down a tree to make this fool Thneed. You can already see where this story is going. The Onceler is in big business now, chopping trees and making Thneeds that everyone needs. He keeps on chopping and chopping until there are no more trees. 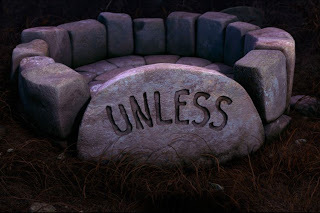 This is when the Lorax gets lifted away, but not before leaving a small pile of rocks with just one word inscribed – UNLESS. We currently live in a world on the border of crisis. And I don’t care what side of the aisle you sit on, it is an irrefutable fact that our natural resources are finite. They will be depleted eventually unless drastic changes are made now. And unless we make those changes now, future generations will suffer the consequences of our inaction. And as stewards of this one world we’ve been entrusted, INACTION is INTOLERABLE. So, what is my invention for reversing this calamity? I don’t have one. I don’t need one. Because it’s already been invented. In fact, this one thing has been being perfected for thousands of years. And there are billions of these things all over the world. If you look in a mirror you’ll see one of them – the most amazing and wonderful invention ever conceived – YOU. And me. All of us. This entry was posted in blogging, daily prompt, Miscellaneous, personal rant and tagged The Onceler by Jeremiah. Bookmark the permalink. “too comfortable to feel the immediate need”. I could not have put it better. For us, as a family, we’ve made the decision that we want something better for our future. My wife and I want our children to grow up appreciating the world around them and to develop a sense of pride and responsibility for stewardship. We understand we’re probably raising a new mutant generation of hippy, but that’s besides the point. It’s important because we’ve seen the need and recognize that any minor inconvenience or added expense now will have much larger impacts for the next generation. The sacrifices will only get more dramatic the longer we as a people wait. Thanks for the comments, Lee! But isn’t it billions of these things all over the world that is the source of pollution? What better way to solve the problem than by altering the source?